Over the past week, there has been a lot of buzz in the Yankees Universe about going after Huston Street, or Chad Quallis or Jose Valverde—or a reliever of any sort. In the past week, ESPN’s Peter Gammons mentioned that the Yankees should "look into a middle reliever." On June 12th, the Yankee blog, Sliding Into Home wrote that the Yankees need to get a reliever because "...until Brian Bruney can come back and remain healthy the Yankees pen is gonna be in pretty bad shape." 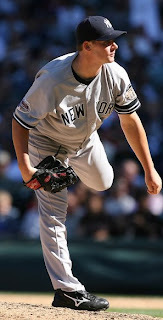 Bill Madden of the New York Daily News had a headline last Saturday that said it succinctly: Yanks Need Relief Pitching. And this past week, Ken Rosenfeld wrote on FoxSports.com that the Yankees "...are in dire need of a setup man...will target the best available late-inning relievers." But here's a stat: Yankees relievers have allowed one earned run in their last 18 innings while striking out 20. Here's another: Since the start of the season, opposing batters are hitting .265 off of Yankee starters; they are hitting .239 off of Yankee relievers. Contrary to the buzz on the blogosphere and to the groupthink of mainstream media, the Yankees don’t need another reliever. If anything, they need to look long and hard at their starting pitching. Most of the talk about the Yankees "bullpen issues" come from earlier in the season, before Girardi was able to get a feel for his pen; when Damoso Marte was pitching injured, and Jose Veras (since designated for assignment), Edwar Ramirez and Jonathon Albaladejo were just pitching awfully. Yet even with their stellar pitching lately, the Yankees bullpen is deemed to be weak. According to Covers.com, the Yankees’ pen ranks 22nd in the league with a 4.48 ERA. Again, however, that is with multiple players who are no longer in the Yankees bullpen. Taking those pitchers out of the equation and calculating the ERA of the pitchers in the pen now, you get a combined bullpen ERA of 3.06. Suddenly the Yankees bullpen would shoot to 2nd place on the list. On May 24th, Gary Armida wrote on these pages, that Phil Hughes should be moved to the bullpen (Hughes didn't make his first relief appearance until June 8th), due to his ability to get hitters out his first time through the order. (It's true; the first time through the lineup, opposing hitters bat .225 off Hughes; the second time, .321). Armida was right. Since Hughes moved to the bullpen, the results have been excellent. In fact, Hughes has had a solidifying effect since he was put out there. It's no coincidence that the bullpen suddenly gelled when Girardi found someone besides Coke or Aceves to go to. In fact, since Hughes first outing, the bullpen’s collective Era has plummeted to 2.66 (including one terrible outing by Tomko). Couple Hughes successful bullpen appearances with Aceves' resurgence (2.75 ERA in May, which is not shabby, but a 2.08 ERA so far in June) and David Robertson's emergence (only 1 ER in the las t 9.2 inning pitched), and most of all, a healthy Brian Bruney, and you have a Yankee bullpen that is wildly underrated at this point in the season. Now, I'm not saying if Huston Street can be had cheaply, then sure, Cashman should look into trading for him. However, what should be stated clearly; is that the Yankees problems with pitching lay less in the bullpen and more in the starting rotation. The Yankees have only gotten 46% quality starts from their rotation, which is 5th worst in the AL. Their starters give up 4.94 runs per game, 3rd worst in the AL. Oh, and one final stat. The Yankees have 3 games where the pitcher left a game in a position to win the game, but then lost it. It's the best in the American League. The Yankees may need pitching, but it's another starter, not in the bullpen.